Commentary on "Introduction: Why Our Church?" The purpose of the lesson commentary in this quarter is to direct attention on evangelism that presents the real biblical gospel message of salvation centered on the nature and work of Jesus Christ. In doing so, it is the our goal to expose and oppose anything that contradicts the finished work of the atonement accomplished by our Savior Jesus Christ on the cross as clearly outlined in Scripture. 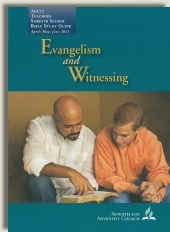 The basis for Christian 'Evangelism and Witnessing’ is the well known command first given to the apostles by Jesus Christ recorded in Matthew 28:16-20 where he says to “Go therefore and make disciples of all nations, baptizing them in the name of the Father and of the Son and of the Holy Spirit…”. In other words, preach the gospel message. There are many ways to present or proclaim the gospel but it important to realize that there can only be one message. The official Quarterly introduction makes the candid admission that only those within the Seventh-day Adventist church 'proclaim “present truth,” the Three Angels’ Messages of Revelation 14:6-12’. It isn’t so much that Adventists insist on having their own unique interpretation for this passage that alarms informed Christians. Rather, when it is learned that certain doctrines such as 'Sabbath Keeping’, the Sanctuary and Investigative Judgment doctrine, the Adventist health message (known as the 'right arm of the gospel’) or the Great Controversy doctrine are packaged in with the biblical gospel message then biblically knowledgeable evangelical Christians have good reason to object to the Adventist concept of 'evangelizing the world’. Considering that the key expression of interest in this passage found in Revelation mentions 'an eternal gospel’ (or 'everlasting gospel’), we must ask the obvious question: What is the eternal gospel? After all, the true biblical gospel is the key for entry into the Kingdom of God. Is it really the 'present truth’ or 'the Three Angels’ message’ proclaimed by Ellen G. White or is it something much different? Since the Apostle John does not define what the gospel message is here in this passage and obviously assumes that the original Christians who received this book would already understand what the gospel message is, we need to search elsewhere in Scripture for a biblical definition of the 'eternal gospel’. Put another way, let the Bible provide definitions and meaning for the very words used in Scripture. And, always keep your definitions and understanding true to the context they are found in. A critically important point is to be found in Galatians 1:6-9 where the Apostle Paul makes it very clear that there can be only one gospel message concerning the nature and work of Jesus Christ and that this gospel is the complete and only foundation for the Christian faith. You cannot alter or add to this message and still be preaching the gospel. Paul declares that all who do so are to be accursed; a point which he considers so important he repeats it several times over. To alter the gospel message is extremely serious business of eternal significance. Furthermore, we see in this passage that we are instructed not to respond to 'another gospel, not that there is one’ even if we think it is coming from an angel of God. Paul makes it clear that understanding the true gospel is vital to our Christian faith. A false gospel will lead you to hell and eternal death. Since Revelation is the very words of Jesus Christ (Rev. 1:1), the 'Three angels’ message mentioned in Revelation must be referring to the very same unaltered gospel message Paul personally received from our Savior and warns Christians not to alter. There can only be one gospel message of Jesus Christ. When you include the word 'eternal’ or 'everlasting’ in your definition you must not and cannot alter the meaning of the gospel message proclaimed elsewhere in Scripture. The jailer asked how to be saved. Paul and Silas responded to his plea with a simple straight forward answer and said “Believe in the Lord Jesus”. They then preached 'the word of the Lord’ and the jailer along with his entire family was saved. Immediately they were baptized on the spot and joined the Kingdom of God. Obviously, Paul and Silas were following Jesus’ command recorded in Matt. 28:16-20 and simply preached the gospel of Jesus Christ. Now, the question remains. What was this gospel message preached by Paul and referred to as the eternal gospel mentioned in Revelation? That is it, all of it. As the well known courtroom expression goes, 'tell the truth, the whole truth and nothing but the truth’. Anything you add to the gospel is something more than the gospel and simply not the gospel. Many years ago my brother Sherman William Harris received this message at age four and joined the Kingdom of God. A few weeks later he died of leukemia and is now safe in the 'arms of Jesus’. I was six at the time and also joined God’s kingdom at the side of my brother. The real gospel message is simple enough for someone even as young as four years of age to understand and respond to by asking Jesus into his/her heart. I heard my brother testify that he knew even at that early age he was a sinner in need of a Savior. He also knew his life on this earth was quickly coming to an end and he would soon die and be with his Savior. I witnessed the joy he experienced knowing he was saved by the blood of Jesus Christ. Copyright 2012 BibleStudiesForAdventists.com. All rights reserved. Revised March 21, 2012. This website is published by Life Assurance Ministries, Camp Verde, Arizona, USA, the publisher of Proclamation! Magazine. Contact email: BibleStudiesForAdventists@gmail.com.